This article is about the Type. For the card part, see "Plant" (card part). 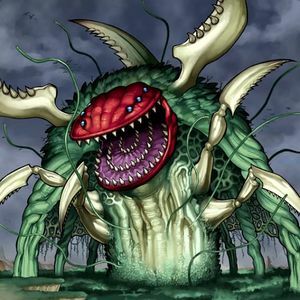 Plant (植（しょく）物（ぶつ） Shokubutsu) monsters were very overlooked and weak until support for the Type was released in the Crossroads of Chaos, Crimson Crisis and Raging Battle booster sets. A general strategy for Plant-Type Decks is to use cards like "Gigaplant", "Lonefire Blossom" and "Lord Poison" to fill the field with powerful monsters. They can go hand-in-hand with Insect-Types as well with cards like "Prickle Fairy". Plants also have Plant version of staple cards like "Solemn Judgment" and "Mirror Force", in the forms of "Pollinosis" and "Wall of Thorns", respectively. Plants have non-Plant support versions of "Marauding Captain" in form of "Twilight Rose Knight", a version of "Witch of the Black Forest" in form of "Violet Witch". Other Plant cards are very similar to certain non-Plant cards, for example: "Dark Verger" and "Quillbolt Hedgehog". Other cards present similarities in the card images like "Wonder Clover" and "Break! Draw!". The usual Attributes associated with Plants are EARTH or WATER. Plant cards usually revolve around swarming and regenerating back onto the field. Unlike Zombies, Plants are often used to fuel effects such as negations rather than for strictly attacking purposes. They have many cards that allow them to be Special Summoned from the Deck and hand but mostly from the Graveyard. Cards like "Lonefire Blossom", "Plant Food Chain", "Lord Poison", "Gigaplant", "The World Tree" and "Miracle Fertilizer" all add major support to bringing back a swarm of Plant monsters to overwhelm the opponent. There are many good Plant-Type Tuner monsters, like "Copy Plant" and "Spore". Plant-Type monsters are used by Akiza Izinski in Yu-Gi-Oh! 5D's. Her signature card, "Black Rose Dragon", is a staple in Plant-reliant Decks. Plant-Type monsters also appear in Yu-Gi-Oh! ZEXAL, used by Tombo Tillbitty and Lotus Hanazoe. Tombo plays with a "Tomato" deck, while Lotus plays a Plant deck with a focus on Special Summoning Plants to Xyz Summon "Battlecruiser Dianthus," which is later Ranked Up to Summon "CXyz Battleship Cherry Blossom". In Yu-Gi-Oh! ARC-V, Yuri uses a "Predaplant" Deck focused on manipulating the stats of the opponent's monsters to weaken them, disrupting their strategies, or using them as Fusion Materials for their own bosses. In Yu-Gi-Oh! VRAINS, Spectre uses a "Sunvine"/"Sunavalon" Deck focused on manipulating the tide of the Duel. Legacy of the Valiant introduced the "Sylvan" archetype, the first one composed solely of Plant-Type monsters. They are focus on the excavate mechanic, have a high variety of Levels and Attributes, being able to build a very flexible Deck, and their effects rely on taking advantage of when they are excavated and sent to the Graveyard; those effects range from searching a monster and recycling cards to destroying a monster and reorganizing the Deck in order to use their effects at their best. The "Aroma" archetype is largely composed of Plant-Type monsters, and focuses on gaining advantage through having higher LP than the opponent. This deck revolves around "Lonefire Blossom" and "Gigaplant" to help swarm the field. Make sure you use the effect of "Gigaplant" effectively in order to pull decent Synchro Monsters out while using "Queen of Thorns" to make your opponent pay life points to summon non-plant monsters. 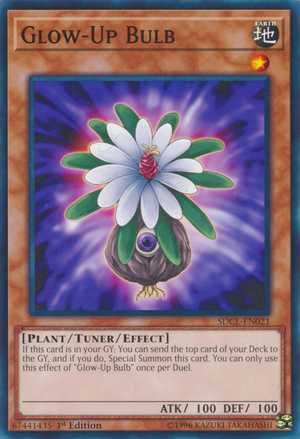 You could use "Tytannial, Princess of Camellias" and combo it with "Gigaplant" so you could tribute Plant monsters Special Summoned by "Gigaplant"'s effect to negate any cards that target your plant monsters. You can also keep the opponent at bay with powerful cards like "Wall of Thorns". This deck also uses "Pollinosis" or "Tytannial, Princess of Camellias" to negate Spells and Traps that destroy multiple monsters such as "Lightning Vortex" or "Mirror Force" or "Torrential Tribute", however, this can be entirely foiled with cards like "Zombie World" and "DNA Surgery", so be sure to pack in "Mystical Space Typhoon". This deck's ability to swarm the field quickly for fuel or for an all out attack can be foiled by cards like these. This is a deck utilizing "Supervise" and "Hidden Armory" which allows players to Synchro Summon quickly with the main monsters "Gigaplant" and "Spore". This can Summon a variety of different Synchros to control the field, but most used is "Power Tool Dragon", which allows the player to grab a quick "Supervise". The successor to the very popular Plant Synchro Deck, Chaos Plants takes advantage of the LIGHT and DARK attributes of splashable monsters, such as Tour Guide From the Underworld and "Effect Veiler", to Summon "Black Luster Soldier - Envoy of the Beginning", in combination with the Synchro abilities of Plants. It rarely uses enough Lights and Darks for it to be worth using "Chaos Sorcerer". Something to note is that it despite being called a "Plant" Deck, it often uses more Fiend monsters than Plants. A derivative of Chaos Plants that uses "Doppelwarrior" and "Junk Synchron".